We have been very lucky to receive many guests in the last few years. One of these was Julian Claxton - a professional photographer from England. He came in February 2016, and was able to show the children how to use a camera. We hope that this will be the beginning of a new relationship with our Centre. He came with members of the Rotary Club of Kigali, who are supporting one of our members of staff. We also welcomed Marion from GIZ in Kigali to our school. She donated the money so that all of the chidlren could have a wonderful 'Christmas' meal. 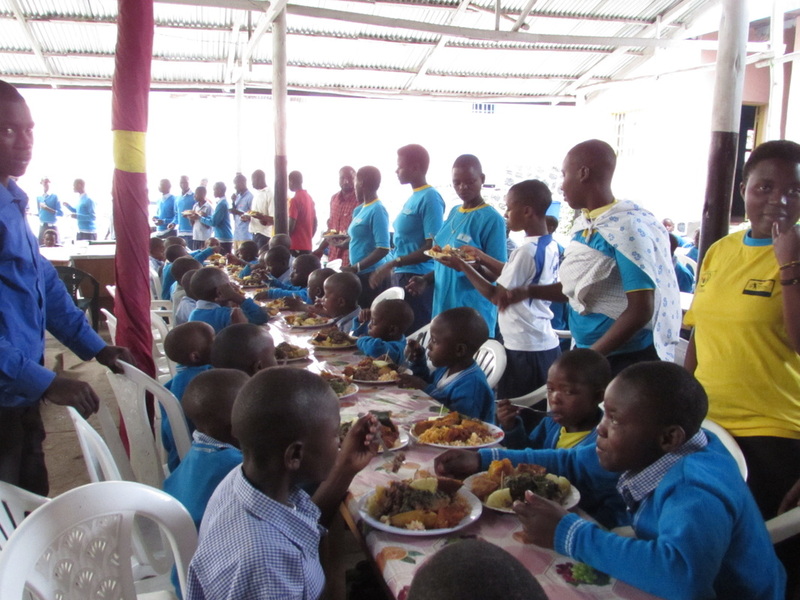 For some of the new children, this was the best and biggest meal they had ever had! 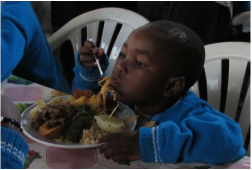 One little boy enjoying his Christmas meal. His chin only just cleared the table! Another visitor, was Isobel from England. She was our VSO volunteer until July 2015. She came back to see us in January, and brought a suitcase full of clothes and toys and two water proof sheets - some of our new young children can wet the beds at night. In October 2017 Isobel returned with four friends. They were able to spend some time with the teachers, bringing new ideas and discussing teaching practice with the Teachers. Again, they brought clothes and school materials with them. These are vital for us, as there is no spare money for us to improve the teaching aids that we have and many of our children do not arrive with anything more than the clothes they are wearing. In January 2018 we welcomed a team from the Kulczyk Foundation in Poland. They brought with them different hearing aids devices to help Deaf children from the Nyabihu Demonstration School for the Deaf. 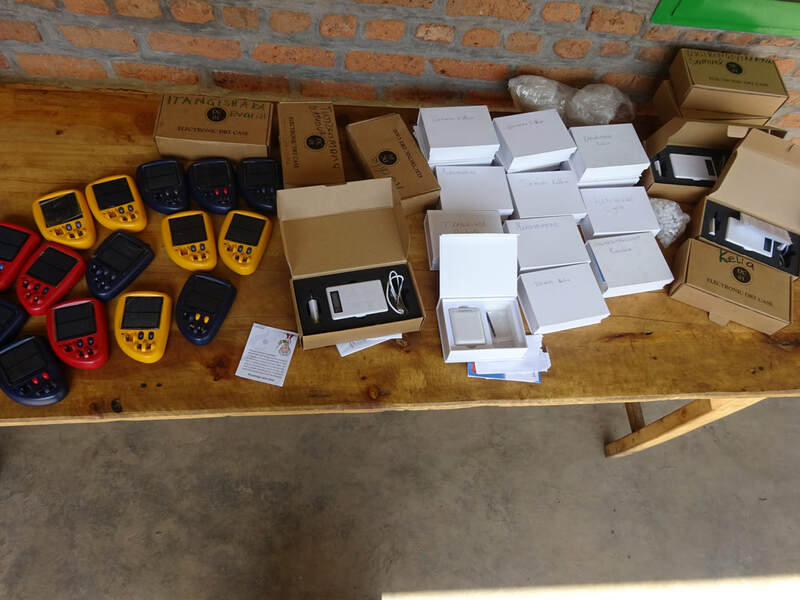 They brought analogue hearing aids, solar chargers, batteries and dehumidifiers. Audiometry testing was carried out on every student at NDSD by an audiologist from Kanombe Military Hospital in order to find out which children might benefit from the use of a hearing aid. 33 Deaf children identified. ​These children were then fitted with aids and a Polish audiologist paid for by the Foundation, stayed at the school for a month to train the children and teachers in good management of the aids, maintenance and problem solving. The children are encouraged to report any changes they notice in the sounds they hear. She also prepared the children to take responsibility for their aids when they return home for the holiday period. These children are happy using the hearing aids; they feel safer while walking because they have improved their hearing and are aware of dangers around them, like an approaching moto. Also, this has become a kind of motivation where they now feel much encouraged to study. A few children, who became deaf after they had learnt language, are beginning to try to speak again and to understand some things that are said to them.How exciting for them!